For the Electric Light Orchestra song, see Telephone Line (song). Utility pole with electric lines (top) and telephone cables. 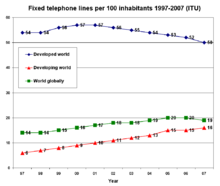 Fixed telephone lines per 100 inhabitants 1997–2007. Cross section of telephone cable of 1800 twisted pairs. Year 1922. In 1878, the Bell Telephone Company began to use two-wire circuits (called the local loop) from each user's telephone to end offices which performed any necessary electrical switching to allow voice signals to be transmitted to more distant telephones. These wires were typically copper, although aluminium has also been used, and were carried in balanced pairs of open wire, separated by about 25 cm (10") on poles above the ground, and later as twisted pair cables. Modern lines may run underground, and may carry analog or digital signals to the exchange, or may have a device that converts the analog signal to digital for transmission on a carrier system. Often the customer end of that wire pair is connected to a data access arrangement; the telephone company end of that wire pair is connected to a telephone hybrid. The vast majority of houses in the U.S. are wired with 6-position modular jacks with four conductors (6P4C) wired to the house's junction box with copper wires. Those wires may be connected back to two telephone overhead lines at the local telephone exchange, thus making those jacks RJ14 jacks. More often, only two of the wires are connected to the exchange as one telephone line, and the others are unconnected. In that case, the jacks in the house are RJ11. Older houses often have 4-conductor telephone station cable in the walls color coded with Bell System colors: red, green, yellow, black as 2-pairs of 22 AWG (0.33 mm²) solid copper; "line 1" uses the red/green pair and "line 2" uses the yellow/black pair. Inside the walls of the house—between the house's outside junction box and the interior wall jacks—the most common telephone cable in new houses is Category 5 cable—4 pairs of 24 AWG (0.205 mm²) solid copper. Inside large buildings, and in the outdoor cables that run to the telephone company POP, many telephone lines are bundled together in a single cable using the 25-pair color code. ^ Public Service Commission of Wisconsin. "Testing, Repairing & Installing Home Telephone Wiring".